The quality of the paper which carries the message also demonstrates corporate standards. The rapidly changing technologies used in the office mean that very often traditional materials are forgotten in the rush to embrace the latest in office automation. Laser, ink jet and thermal transfer printers work alongside familiar plain paper copiers and typewriters, but the paper requirements are very different if the best results are to be achieved. Wiggins Teape Fine Papers marketing manager Margaret Baker explained that different papers will give very different results, according to the printing or imaging process used. The wide variety of office printers now on the market calls for decisions to be made on matching the right paper to the right machine. The result is that the material looks cleaner, sharper and more pleasing to the eye. The information conveyed is read more easily because the image is projected 'off the page' more effectively. Machine manufacturers know how paper affects performance-in fact an integral part of the design and development of every machine is an evaluation of the paper that should be used. For this reason machine manufacturers specify which grade will achieve the best results. There are many times, however, when users ignore this advice and use paper which is either cheaper or more convenient. Ink jet printers, as their name implies, work by expelling droplets of ink. The process requires the paper surface to have a properly balanced chemistry to allow controlled ink absorption and 'spread' that enables the droplets, which are minute dots, to join and dry quickly. The result should be sharp, well defined characters, that appear to be complete images rather. than a series of dots. 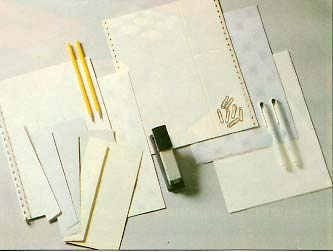 Thermal transfer works by heating a series of thermal needles which on contact with special ribbons transfer an ink or dye to the paper surface. The need here is for a particularly smooth paper surface to allow maximum contact area with the thermo-sensitive printing ribbon. In addition, good absorption characteristics are necessary to allow the heated ink to key the sheet's surface and provide a permanent image. Laser printers employ what is essentially a xerographic 'dry toner' printing system. Therefore the properties needed in a paper to achieve good quality 'xerographic' copies apply here equally. It is a mistake to believe that any office paper will perform satisfactorily on a dry toner copier or laser printer. Copier paper is significantly different from standard office papers in three distinct ways. Copier paper has a far lower moisture content which combats curl from the heat generated within the copier, thus avoiding jamming. It also has controlled curl characteristics which compensate for paper's natural tendency to 'move' under heat. Finally the copier paper surface is designed for good toner adhesion, without flaking. Each of these different printing systems can produce images on other grades of paper, although the results fall far short of those achieved by the correct grades. The image is not as sharp because the ink or toner will not have formed correctly on the page. This difference in quality is not always realised until the results are compared with those achieved by paper designed for the printer. New grades of paper such as Courier have been developed to meet the various needs of current office printers by bringing together different papers into one range. Grades like Courier offer the consumer the opportunity to meet the needs of different printing processes within one range which results in the right paper being used for the right job. The printed works. always looks good if it is produced on paper that creates the correct ink to paper contrast and therefore enhances the printed word.